Nice shakudo sukashi menuki of Omodaka Kamon. Many samurai families used the Omodaka plant, or water plantain, as their family crest. The precision and detail of the sukashi cutout make a great set to own or for mounting. Menuki comes with kiri box. Click on picture for a more detailed look. Unsigned - Probably Goto School or in the style of Goto school. Very nice shakudo nanako set of Amaryu (Rain Dragon) done in the Goto School tradition. 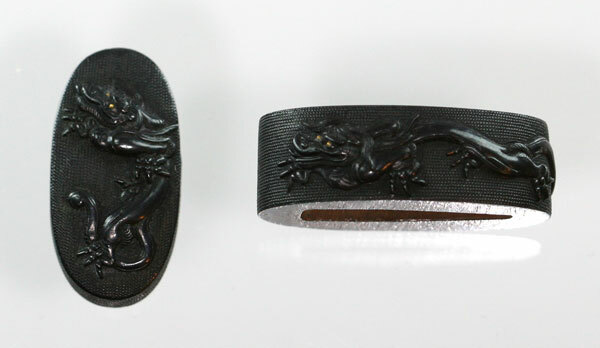 In very good condition, one can see from the quality of the shakudo(very deep black) that this is a set of very nice quality. The carving is done very well, the dragon well carved and executed in the limited space. Work like this level can only be from a major school. The nanako also shows quality and consistency as well. In very very nice condition, for a great mount, or to be enjoyed on their own. Click on picture for a more detailed look and description.